I have been doing some knitting - in four of the major knitting groups: Cables, Lace, Colorwork, and Sock. Presenting Nordic Diamonds, knit from pattern in Victorian Knitting Today with the boring name of "Double-bordered scarf". At first, I was not sure of the combination of yarn and pattern, but after getting past the first repeat, I am starting to really like it. However, it is also a project that requires attention. Because of the double-border, each row of knitting requires two different rows of the stitch pattern (one on the left and one on the right). I went to the public library yesterday on a whim and was happy to find Folk Mittens by Marcia Lewandowski. Ever since seeing these mittens over at Pat's site, I have desired making these mittens. However, when I got home I realized that I did not have the correct yarn in my stash. 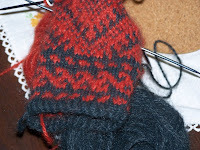 I did however have yarn suitable for the Anatolian Mittens, which I started yesterday. I am eager to finish these, as it has been really cold here. They also require a bit of attention. Below is a not-very-good picture of the pattern that will appear on the back of the hand, I did not get a good picture of the palm pattern, but I will soon. It became apparent that I needed a project that did not require such careful attention as my other current projects. 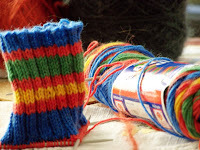 And so I started "Gentlemen's Plain Winter Socks" from Knitting Vintage Socks, made less plain by knitting them in bright rainbow-colored self-striping yarn. That lace pattern is one on my to-do list. I like the geometric shape of it. My main problem with that book is trying to figure out which of the patterns to try first. I like almost all of em.